When you plan your content calendar, it’s important to think about frequency. Maybe you aim to share on social media daily, blog twice weekly, publish an enewsletter monthly and offer an ebook biannually. As I work with clients on content planning — a process I love and believe is essential — the most common questions I get are: How much content should I produce? How often do I need to post? SEO folks say the more we post, the better. Of course, it’s great if content is plentiful. But not just for the sake of volume. Ultimately, I argue that what matters is the quality of your content. Producing quality shows customers and prospects you value quality. If you post content just for the sake of posting content, you demonstrate to your audience that you don’t value quality. 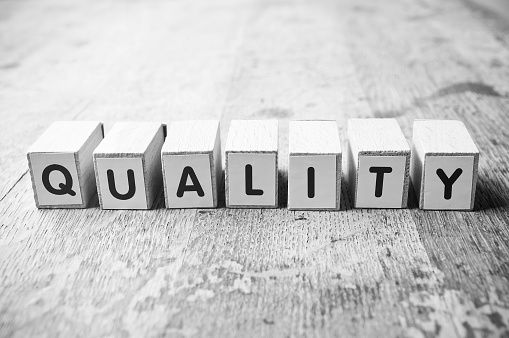 And if you don’t value quality in your marketing, where else might you not value quality? That’s not a good message to send. Quality content brings people back and engenders trust. I don’t have to tell you, as content creators, we are contributing to a universe that is already oversaturated with marketing messages. (Side note: I encourage you to check out this TED Radio Hour episode on attention.) But I do believe when you take the time to be strategic and thoughtful with your content — and to produce content that is actually useful to your audience — that people will choose to return to you. They’ll learn they can trust you. Crappy content doesn’t do that. Quality over quantity shows respect for your audience. Producing content regularly is smart, we know, because it helps keep you top of mind. But it’s more important to demonstrate you know your audience’s time is valuable. Don’t waste it. Quality content is a better investment. A few solid case studies, well-researched white papers or entertaining podcasts are invaluable compared with numerous thrown-together articles. Useful content can be repurposed and repackaged for use again and again. When we talk about content frequency, resources often drive the conversation: How much time do we have to put something together? How much money can we spend? But what we should be asking ourselves before anything else is what our audience desires. What information are they seeking? What can we offer that they can’t get anywhere else? How much time do we expect them to spend with our content? How would they like to receive information? Once we figure out the answers to those questions, then budget and frequency should be considered. That’s how you’ll get the most out of your marketing dollars.